Times are hard for Russian circus performers in Las Vegas, with many former stars struggling to eke out an existence, but juggler-turned-animal trainer Gregory Popovich has found a new way to make a living – proof that there is always hope. This week it was April 1st - April Fools’ Day as we say in America. In Russia it's called "The Day of Laughter." Either way, it doesn't seem like there's a lot to laugh about these days. The Ukrainian-Russian situation continues. The Middle East peace talks have disintegrated. The mysterious disappearance of the Malaysian plane and all of its passengers and crew is still unsolved. And in Washington State the death toll from the gigantic mudslide may never be known at all. It's depressing. This is the time we need Gregory Popovich, circus performer, author, late-night talk show guest, and now the star of his own movie. It's not that the world of circus can make tragedies go away, but it can relieve the pain that everyday living sometimes brings - at least for a few hours it can be a place to rest our minds, relieve our aching souls - souls that could use a break from traumas and the sorrows they bring us. I spoke to Gregory by phone this week, hoping he'd have Washington, DC on his touring radar screen, but so far, he's not coming here this year with his animal show. I have to wait until 2015. In the meantime, he talked to me recently about his new 90-minute film, POPOVICH and the Fabled American West, about the life of a down-and-out homeless Russian circus performer living in a Las Vegas junkyard with some stray cats, dogs and other living creatures. Then the authorities come and threaten him with eviction unless he comes up with some big bucks. It's a compelling story, in that it does, in its own way, tell the tale of many Russian circus performers in Las Vegas today, particularly those of Popovich's generation (he's 49). They may not be on Skid row, surrounded by animals they then befriend and ultimately train to perform, but the point is that many Russians who were once the stars and starlets of what was known as the Moscow Circus are doing anything to stay alive. Driving taxis. Cleaning hotel rooms. Waiting tables. Driving trucks across America. Depending on who you ask, the Las Vegas they once performed in is now just a place to survive. Some even go a step further. They say that these former circus professionals that toured the world, slept in five-star hotels, and lived a Hollywood life on the road, are no longer "living" but "existing". Welcome to capitalism. But there's something about Popovich's life that makes him different. 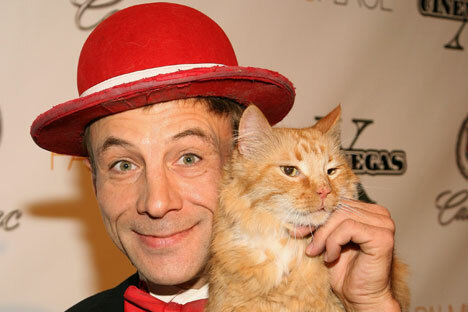 A little over a decade ago, this former juggler-turned-animal trainer came up with a unique idea (a must-have for a good circus act) and like the protagonist in the movie, he turned to more than 25 once adopted stray animals to create a new show called "The World Famous Popovich Comedy Pet Theater". He and his family have now found a new way to earn a living. In essence, he's the star of the film of his own life. He's found the American Dream, and is bringing smiles to our nation's faces – smiles we need at a time when there seems to be little to smile about. These aren't just any animals. They are rescue pets from the various animal shelters around America: Cats. Dogs. Birds. Mice. And now a miniature horse that looks like a white unicorn called Diamond, who seems to complete his animal family. His trained cats have been featured on late night shows such Jay Leno’s The Tonight Show on NBC. When he's not touring the U.S., he performs his flagship show on the Las Vegas Strip, at Planet Hollywood Hotel and Casino. But it's his creative and ambitious spirit that comes to life on the big screen, where his tale of the down-and-out performer ends up finding the American Dream. Only it's not just the circus artist who saves the day: In this movie the animals take center stage and it’s their tricks that win over the audience. I don't know about anyone else, but I sure could use a dose of laughter these days.